Happy 50th Birthday Malaysia ! Half century old .. and proudly standing strong! 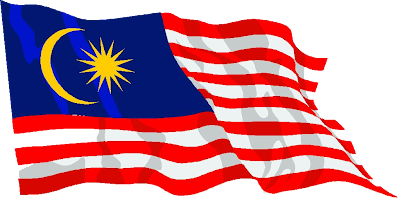 Proud of my country .. proud of my nation .. proud to be Malaysian. at Sir Tan's penthouse at Indah Samudera. Charles: I only know like 10% of the people here .. So much for being "well-prepared" .. I was fully equipped .. I even brought the charger. But it turned out to be ok. My social side of me took a break for some long weekend holiday, so I didn't exactly ya-ya that much. But people around me are sociable enough ..
Ok fine ! I did ya-ya'ed .. it'll never escape me. Happy now??!! 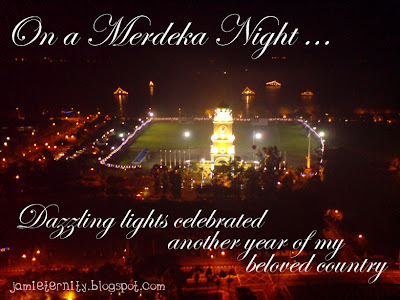 The view from the penthouse was very strategicly facing JB's Dataran Merdeka, where I was eagerly waiting for the fireworks to light up the skies. But I failed to capture the slightest glimps of my favourite lights. 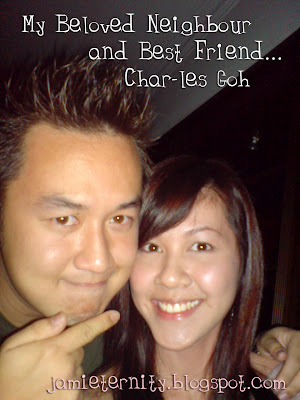 We knew each other's existence since the day I entered Convent. But we never really got to know each other .. let alone know how he actually looked like until after leaving high school for 7 years. When people aren't much sober, it became the Black-White-Guess, Boy-Girl-Spit game .. or the Hitam-Putih-Teka, Laki-Pompuan-Ludah game. It's just crazy ..
Not very fair game though coz SirTan has his whole entourage waiting on him and volunteering to drink on his behalf, while the kentang (potato) only had me on his side .. which isn't of much use since I fail miserably at alcohol. And he sabo'ed me in the end, and I had to leave him on his own and start my addiction to LocoRoco.